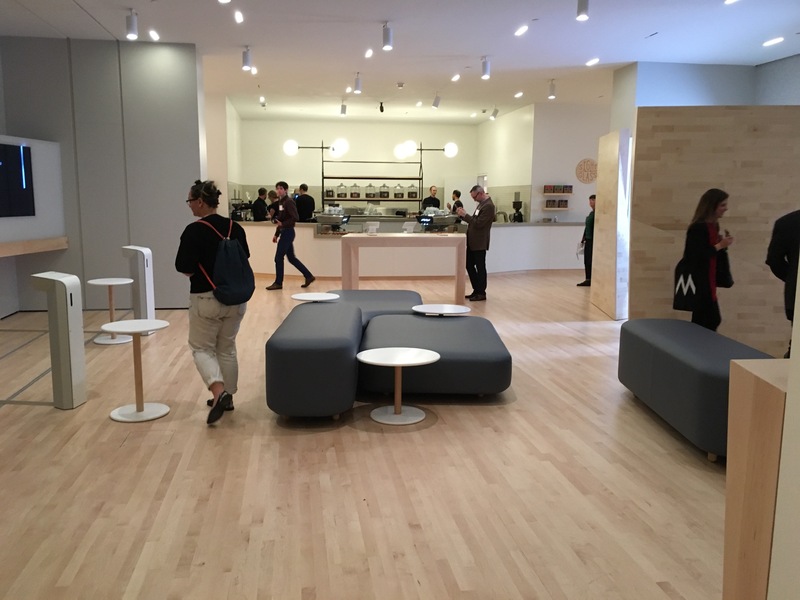 New SF Museum of Modern Art: In a word… Breathtaking! It took three years to transform and expand the San Francisco Museum of Modern Art (SFMOMA) but it was well worth the wait! With nearly three times more gallery space than before, the stunning 7-floor museum features a vast collection of modern and contemporary art, photography and sculpture. 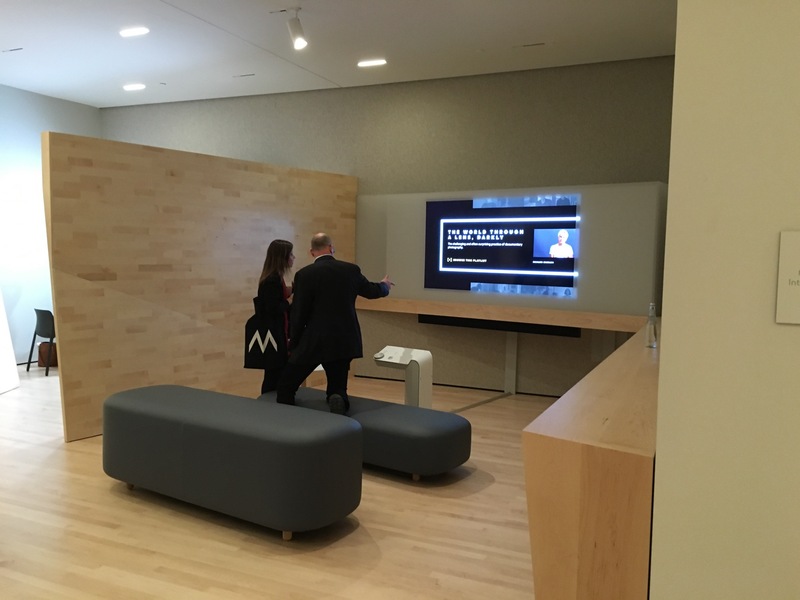 And SFMOMA’s transformed digital program creates a cutting-edge experience for all of its visitors, including a groundbreaking new mobile app to help people engage and learn. We got a sneak peek prior to the museum’s May 14, 2016 opening to the public… and in a word, the newly expanded museum is “breathtaking!” We’ve highlighted below some of the favorite parts of our tour. 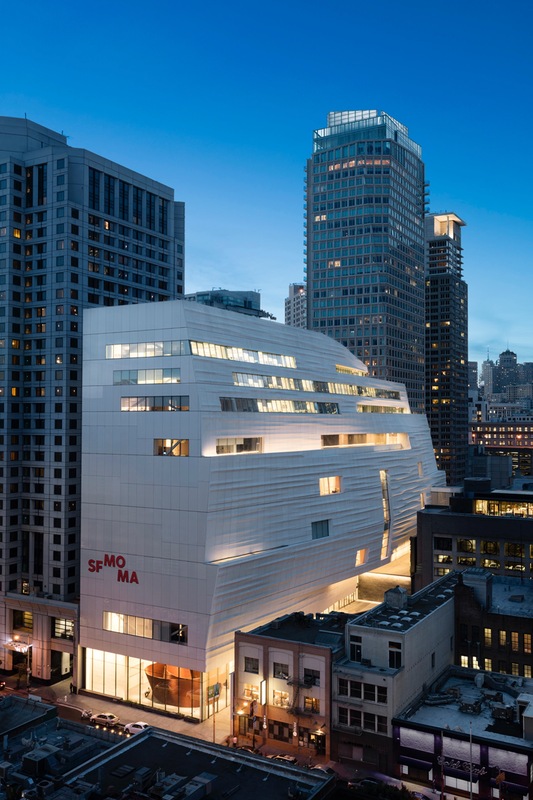 SFMOMA is one of the city’s most popular museums – and a big draw for visitors from around the world. Advance online tickets are highly recommended because it’s sure to sell out, especially in the next few months and into the busy summer season. There are two main entrances to the museum – a new entrance on Howard Street and the entrance on Third Street. From both entrances, stairs lead visitors to Schwab Hall, the hub of SFMOMA. 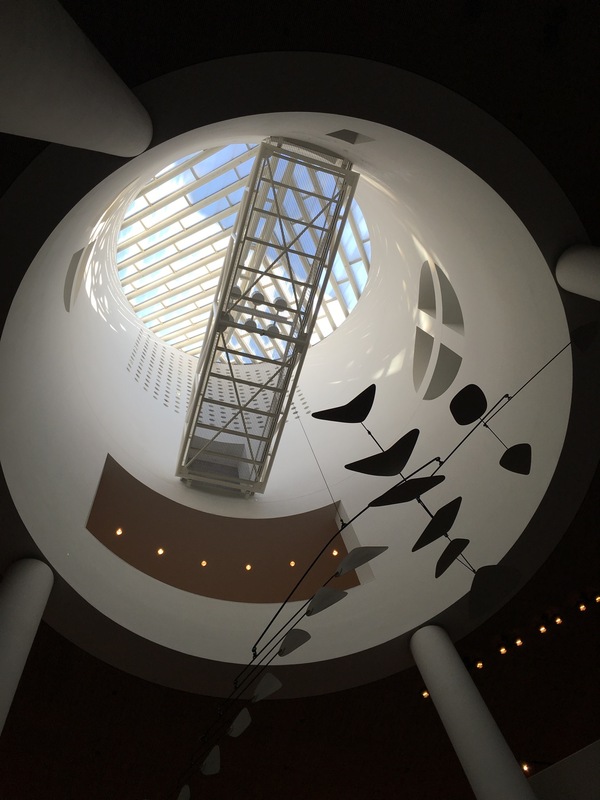 Inside, the atrium’s iconic oculus floods the space with natural light and features Alexander Calder’s 27-foot-wide mobile hanging from above – looking up is a WOW moment (see pictures below)! 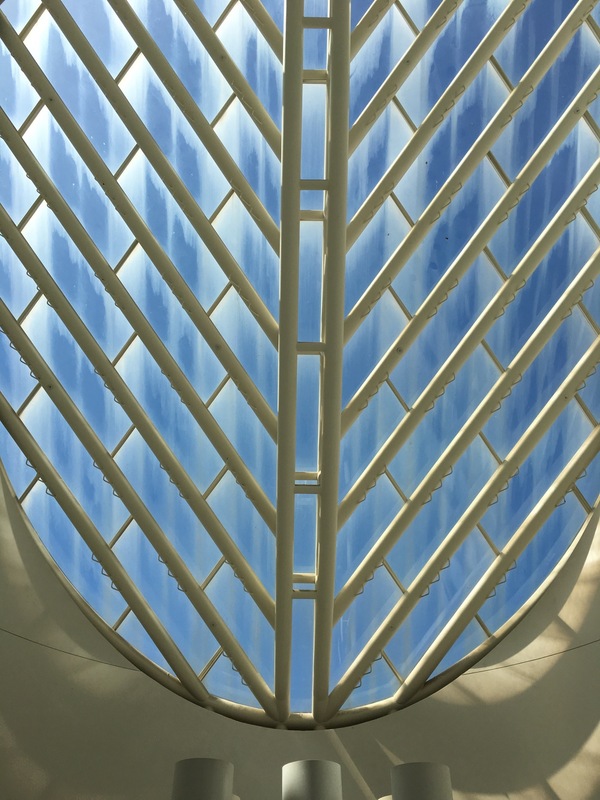 All visitors have free public access to nearly 45,000 square feet of SFMOMA’s ground-floor galleries and its spectacular new atrium. And if you’re 18 and younger, you get free admission to the whole museum – that’s a great deal! Exhibitions include the renowned Fisher Collection, one of the world’s greatest private collections of postwar and contemporary art. Selections on view feature important works of American abstraction, Pop, Minimal and figurative art, works of German art after the 1960s, a range of Calder works from the late 1920s to the late 1960s, and sculptures by leading British artists. And the new Pritzker Center for Photography offers the largest exhibition, interpretation and study space dedicated to photography in any art museum in the nation. 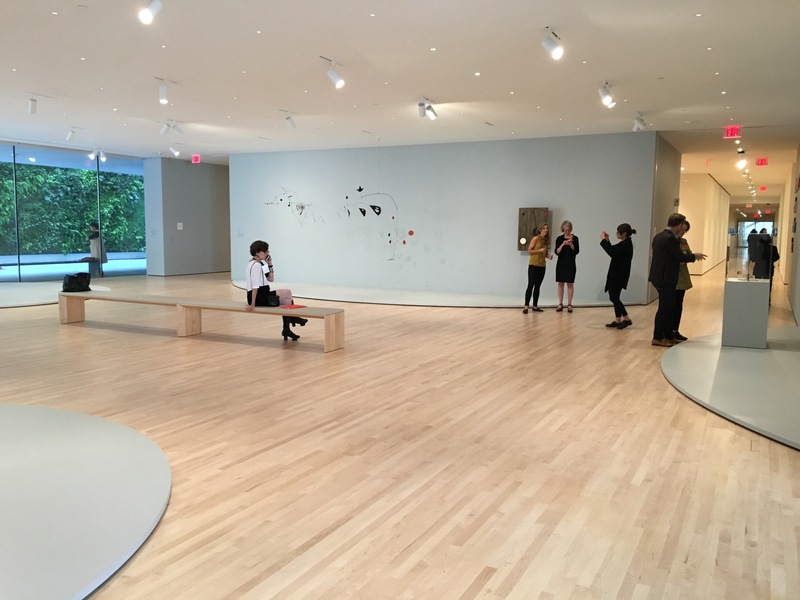 OK… so it’s not really an “official” meditation room, but that’s what it feels like when you walk inside this unique octagonal-shaped gallery (pictured below) – featuring seven tranquil works of art by Agnes Martin. The minute we stepped into this room (located at the far end of the 4th floor) we felt a sense of calm and relaxation. There’s a comfortable round cushioned seat in the middle of the room where you can sit semi-surrounded by mesmerizing works of art and enjoy your moment of Zen. 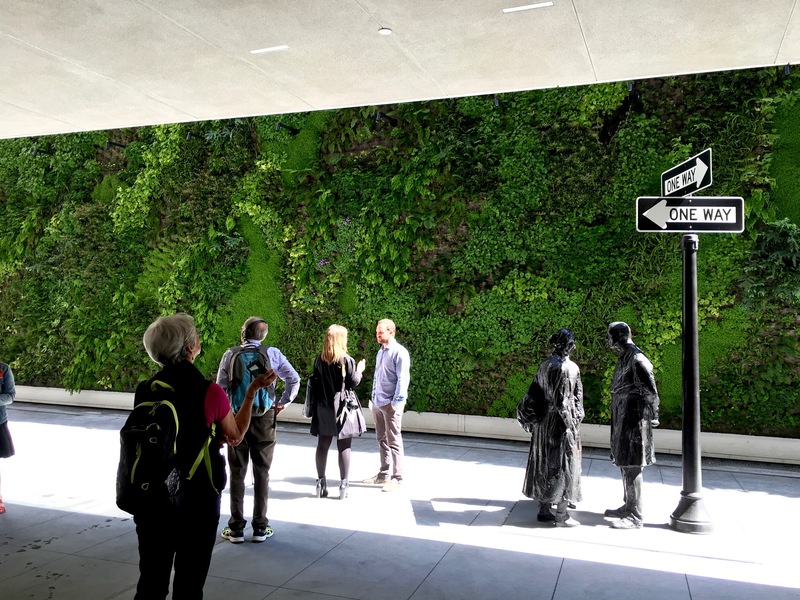 The new third-floor Sculpture Terrace is home to the largest public Living Wall in the nation – it’s impressive. Made up of over 19,000 plants and 21 species native to the Bay Area and Northern California, the scenic Living Wall makes a stunning sculpture and gallery backdrop (see pics below). 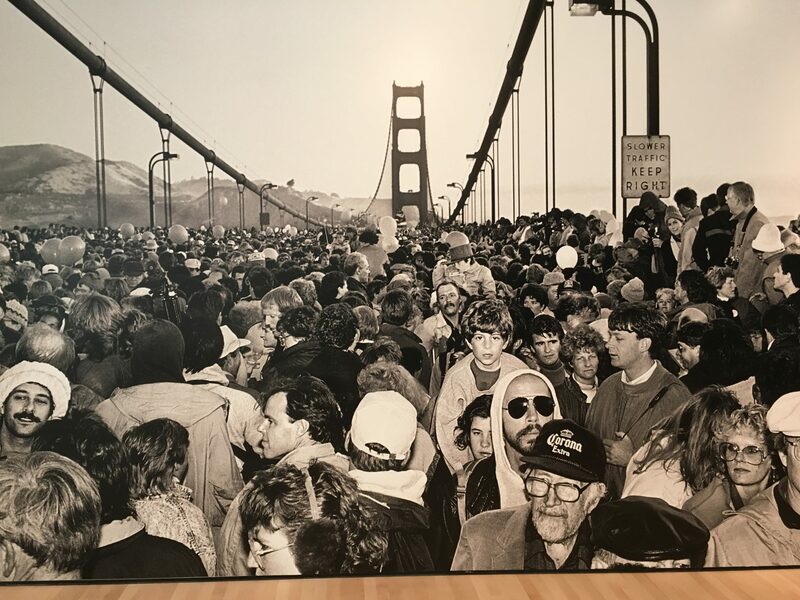 This enormous black-and-white wall photograph depicts the crowds on the Golden Gate Bridge during its landmark 50th Anniversary celebration on May 24, 1987. We were there that day (standing near the middle of the bridge) surrounded by over 300,000 people and will never forget hearing the creaking sounds and feeling the swaying of the bridge – it actually sagged 7 feet! It was a fun, but very scary day… and a miracle that the bridge didn’t collapse under the weight of so many people. If you were there too, you won’t want to miss checking out this picture to see if you can spot yourself in the gridlocked crowd. This colorful exhibition of works features American Pop and Minimal artists from the Doris and Donald Fisher Collection, including: Roy Lichtenstein, Andy Warhol, Chuck Close, Philip Guston, Donald Judd, Sol LeWitt… the name a few. We love the “Geometric Apple Core” (pictured below), an 8-foot-high sculpture by Claes Oldenburg and Coosje van Bruggen from 1991. 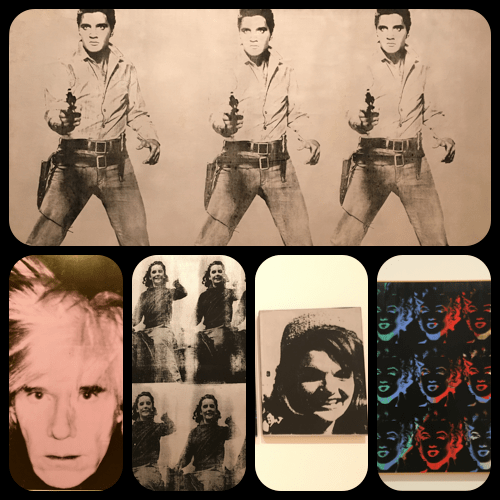 SFMOMA has a wonderful collection of Warhol’s masterpieces, including his self-portraits, Triple Elvis, Liz Taylor, Marilyn Monroe, Dolly Parton, Marlon Brando, Jackie Kennedy… and more. This is one of our favorite galleries. 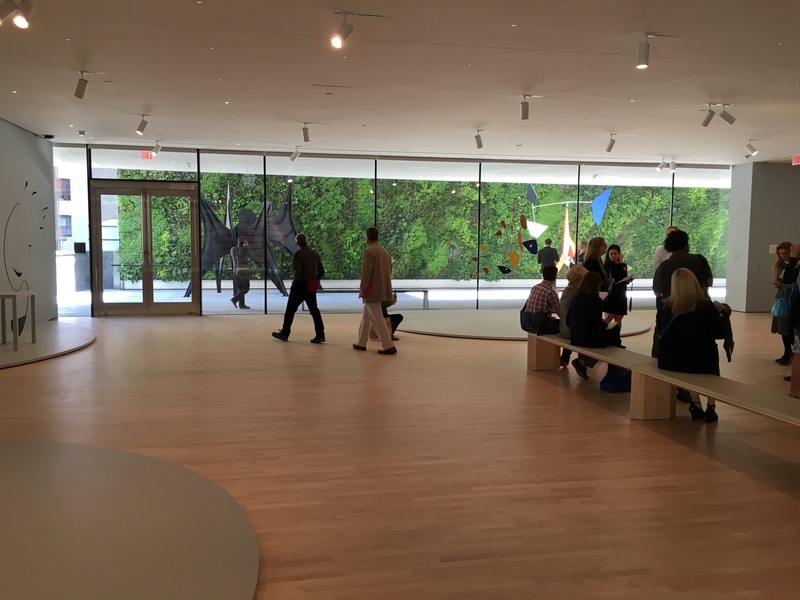 This beautiful gallery, overlooking the Living Wall (pictured below), features Alexander Calder’s stunning mobiles. 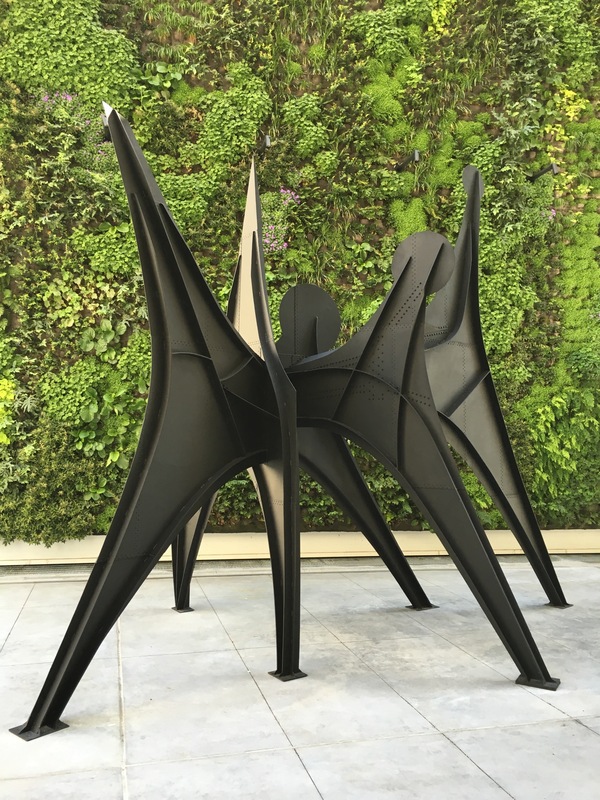 The exhibit is the inaugural presentation in SFMOMA’s Calder gallery and marks the first in a series of annual exhibitions about his work. Visitors can see Richard Serra’s unusual “Sequence” sculpture from outside the museum’s Howard Street entrance. Inside, admire the monumental sculpture from the Roman steps – a seated viewing area, located in the glass-walled Roberts Family Gallery on the museum’s ground-floor. It’s visually stunning… as you can see from the picture below. Enjoy a delicious lunch or dinner at the museum’s new restaurant, In Situ by Michelin three-star Chef Corey Lee. The restaurant is located on the museum’s ground floor. Dine inside or al fresco at Cafe 5, overlooking the 5th floor’s outdoor Sculpture Garden (pictured below). The restaurant offers delicious light California-fusion cuisine. 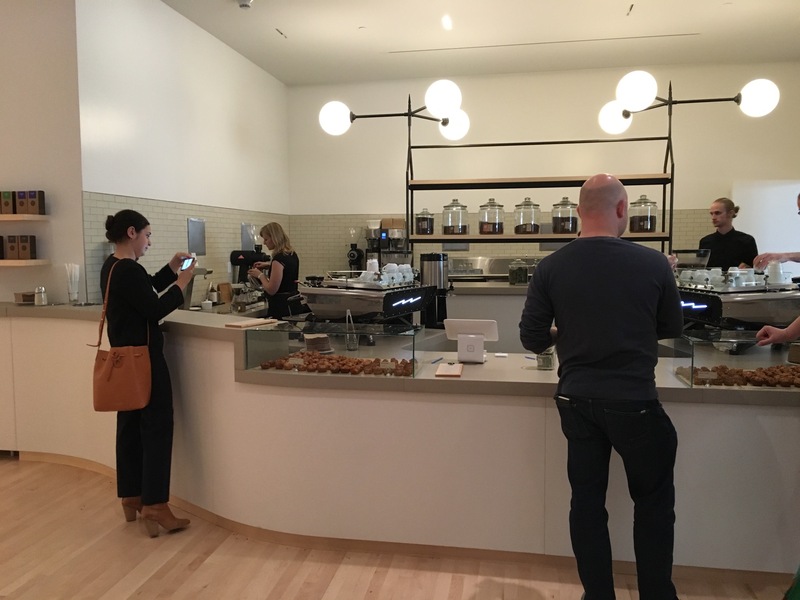 Relax and enjoy coffee, espresso and pastries at Sightglass Coffee Bar (pictured below), located on the 3rd floor, adjacent to the museum’s new Photography Interpretive Gallery. Additional seating (tables and chairs) is also available just outside this area, overlooking the main atrium. The coffee area also features two interactive spaces (in the painting and sculpture galleries), with touch screens and digital tables. There are also tables where you can recharge your smartphones, tablets and laptops. Take a self-paced audio tour of the museum using the new SFMOMA App that was upgraded for the May 2016 launch. 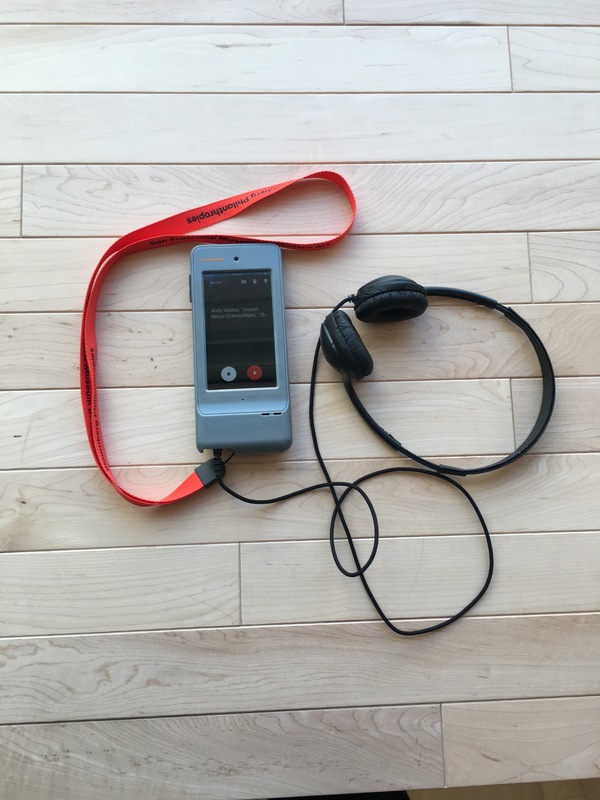 The museum is offering Apple Touch devices with headphones (minimal rental fee) for those of you who don’t have iPhones. Note: If you have an iPhone, don’t forget to bring your headphones with you to take advantage of the audio program (app is free). Sorry Android users… there’s no app at this time (it’s in Phase 2). The museum store offers a selection of fun gifts. Shop for everything from art, jewelry, watches, scarves, apparel, books, posters, t-shirts, and notecards, to decorative gifts and bar accessories. Looking for a unique and creative spot to hold your special event? SFMOMA is a perfect venue for hosting a corporate event. The museum is conveniently located in SF’s popular SoMa district, just a short walk from Moscone Center and downtown hotels. Click here to visit SFMOMA’s website for more info on hours, tickets, membership, current and upcoming exhibits, restaurant reservations, corporate events and mobile app. Enjoy your visit to SFMOMA! 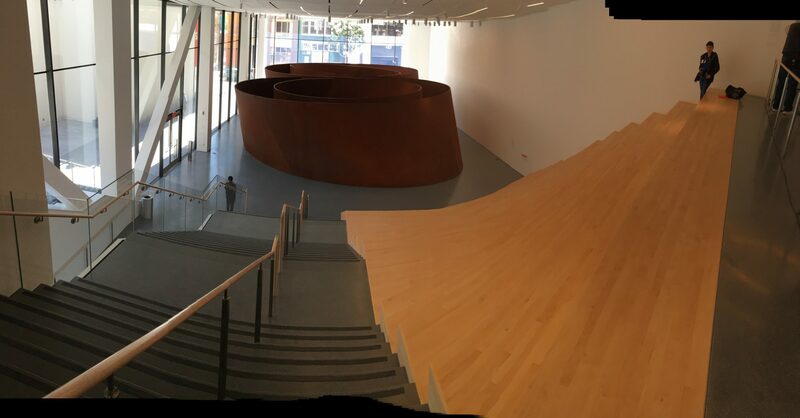 This entry was posted in Fun Things to Do, San Francisco Bay Area and tagged agnes martin, Cafe 5, Calder, contemporary art, Fisher Collection, In Situ, living wall, meditation room, new SFMOMA, San Francisco Museum, sf modern art, sf museum, SFMOMA, SFMOMA App, warhol on May 4, 2016 by Alana. Thanks so much for the wonderful ‘armchair’ SFMOMA tour… I loved it and will now have to figure out a way to go there in person. What’s a hop from DC to SF when this awaits! How fortunate you are to have this on your doorstep. Thanks for your comments. Hopefully this will inspire you to take that hop from DC to SF!